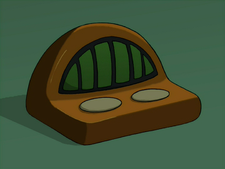 An intercom robot (voiced by the same person as Ms. Johnson) appears in Bender's Game. Fry: What? I haven't changed. [He presses the intercom.] Suz. Have I changed? Ms. Johnson: No, sir, Mr. Fry. Leela: I don't care what Ms. Johnson says. That guy's turning this place into some kinda... business. Fry: Uh... Ms. Johnson... Please bring in some more chair fuel. Fry: Ms. Johnson. You've never lied to me. Am I still a good person? Ms. Johnson: I don't know, sir. I'm a program built into the intercom. Ms. Johnson: Mr. Fry. Your two-o'clock magician is here. Fry: Believe it or not, I have more important things to do today than laugh and clap my hands. This page was last edited on 4 February 2016, at 10:47.